Most of our attention has been focused on Hurricane Sandy's effects on the northeastern states. But the superstorm was so enormous, it affected Chicago as well. 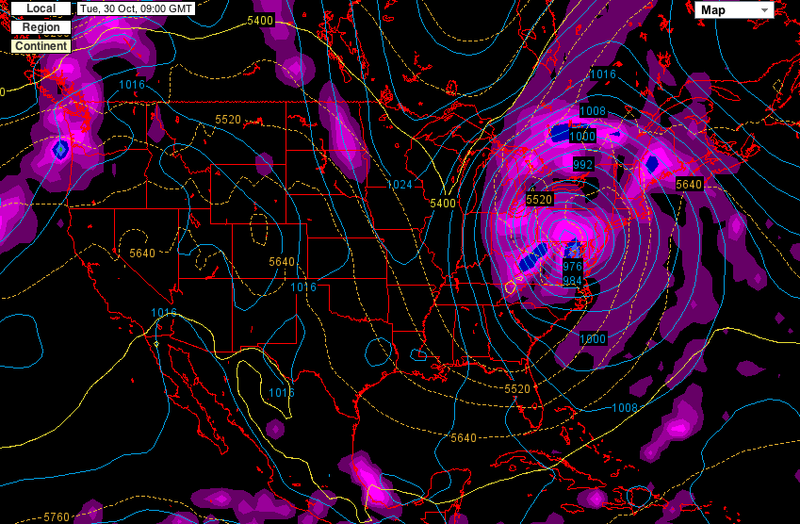 Tight isobars indicate the intensity of the low pressure system. 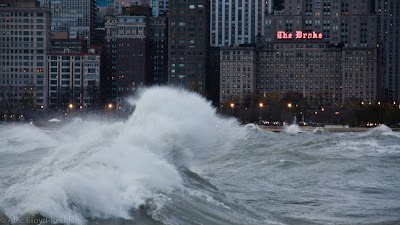 We were spared the drama and destruction of Hurricane Sandy. But we got some of the wind. 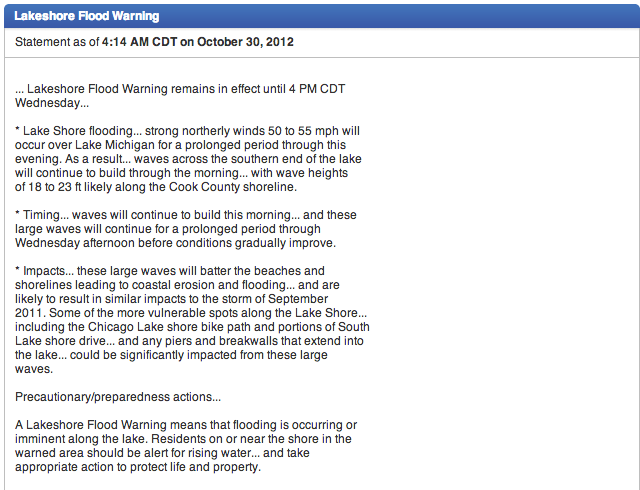 Not our usual marine forecast and flood warning. 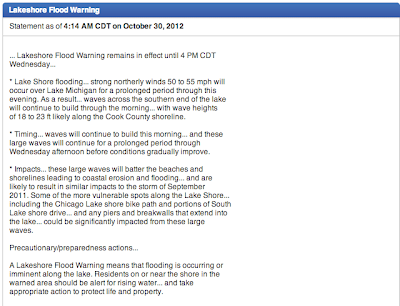 Waves to 23 feet on Lake Michigan, with occasional waves up to 31 feet; this called for cameras, not kayaks. 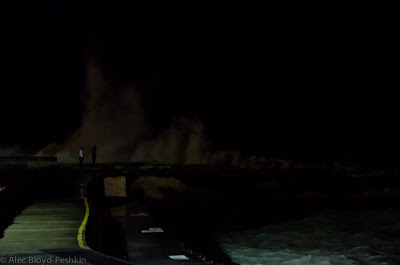 Of course, the waves weren't that big near shore, but they were big enough. Waves exploding over the break wall at North Avenue. 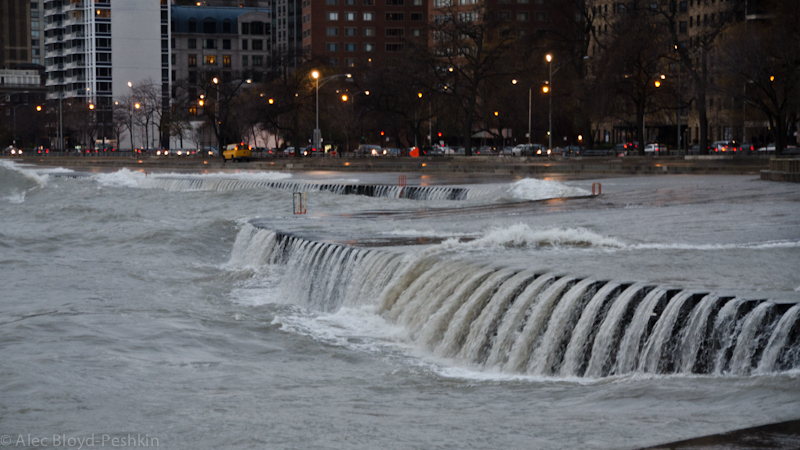 Gale-force winds blowing the tops off breaking waves near Oak Street Beach. Water streaming back down after flooding the bike path. 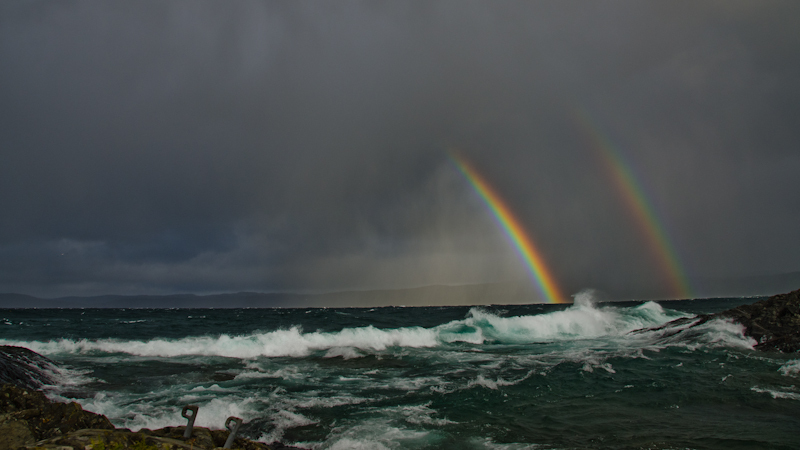 As evening approached on Tuesday, the waves continued to build. 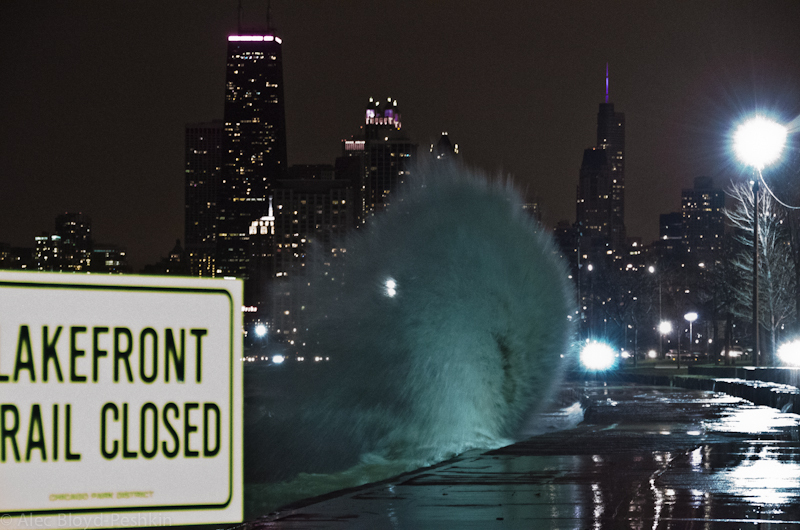 The lakefront path was closed, but Chicagoans gathered at a safe distance to watch the mayhem. The path was a dramatic but perilous place. Wave watchers put the plumes in perspective. 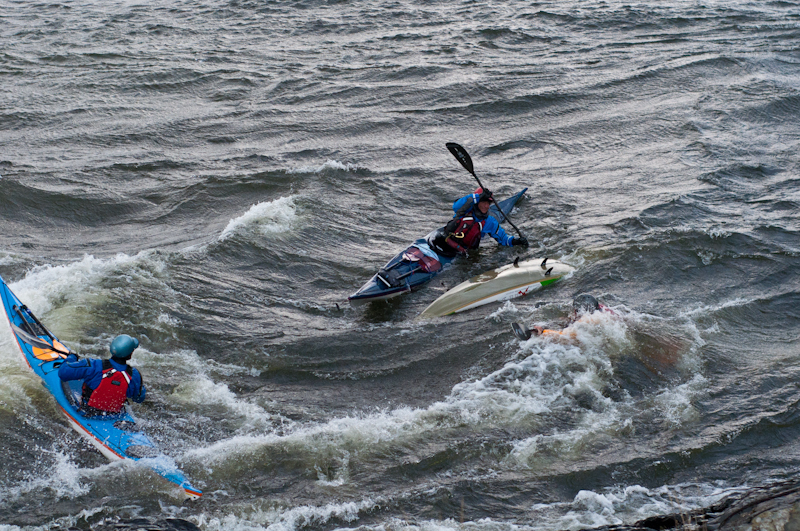 Our Fall whitewater kayak class at the West Cook YMCA has begun. Thirteen students in an amply chlorinated pool means one of two things: suggest they buy nose plugs, or make them. President John F. Kennedy admires a new set of nose plugs, drying on a homemade rack between dips. Today we invested in $8 worth of wire and $13 worth of Plasti Dip--enough material to make hundreds of nose plugs--and began clipping, bending and dipping. Soon these nose plugs will adorn the faces of our students, allowing them to learn to paddle, brace and roll without getting a chlorinated nasal irrigation. Wire cut, bent, and waiting to be dipped. After a second and third dip, the nose plus will dry and be ready to use. What's going on in these photos? Check out our guest post on Go Kayak Now! We have to admit we weren't convinced that the location for this year's Gales would work. Sure, Naturally Superior Adventures is in a lovely place, uniquely suited for optimizing our changes of having the ideal mix of wind, waves and current for an intermediate, rough-water symposium. But dang, what a drive! Would people attend? 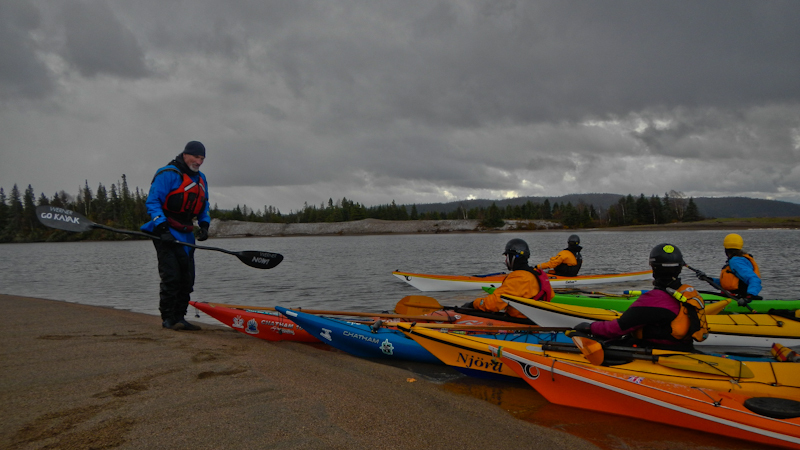 Leon Somme of Body Boat Blade, Intl., under a glowering sky. 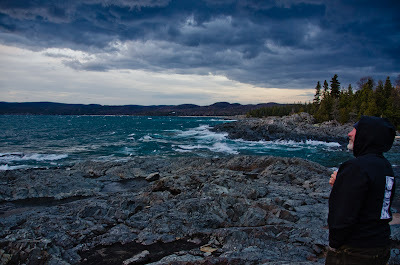 Those who did were amply rewarded for the hours they spent driving to Wawa, Ontario. We had four days of wind and waves; the tide race at the mouth of the Michipicoten River was sometimes exciting, sometimes intimidating. 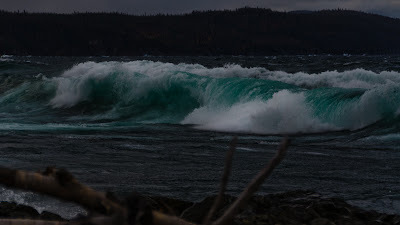 Waves rolled onto Sandy Beach and rebounded off the rocks along the shoreline. 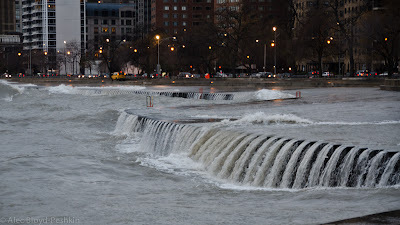 Swift current poured out of the river mouth, and strong eddies formed on its sides. 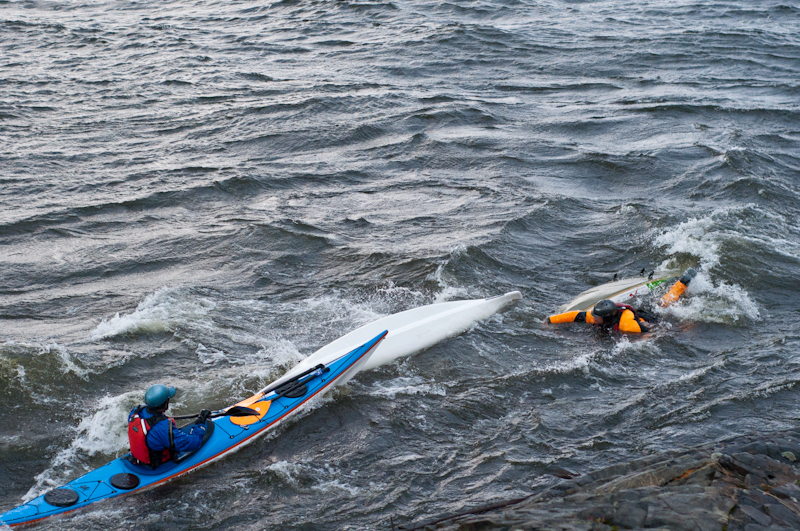 There wasn't a rough-water skill we couldn't work on. Waves roll in next to Naturally Superior Adventures. And work on them we did. 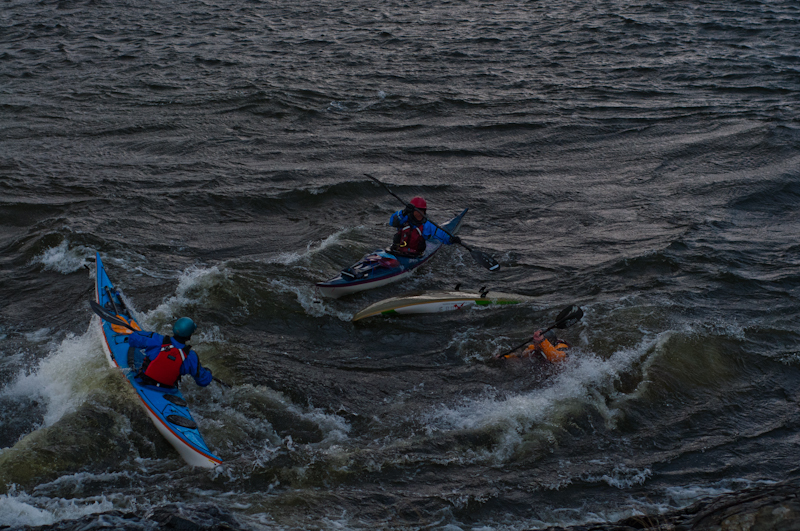 On Friday, a surf session devolved into a body surfing session in response to 35-knot headwinds. 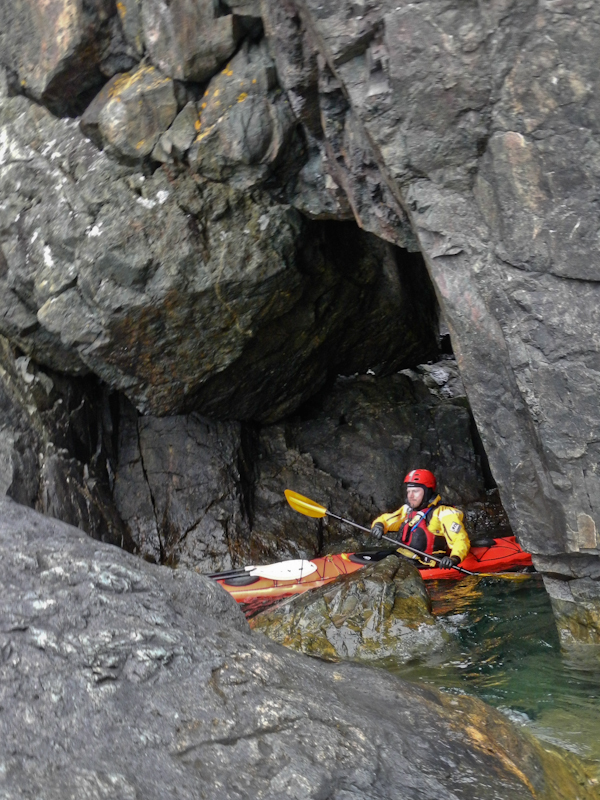 On Saturday, small groups of coaches and participants set out on journeys along the coastline, punctuated by rock gardening and slot shooting, as well as some unplanned but well-executed rough water rescues. Leon, Alec and Keith execute a surf-kayak rescue in the tide race. 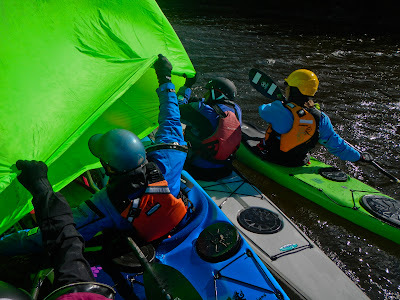 A group explores rafted sailing with the aid of a storm shelter. 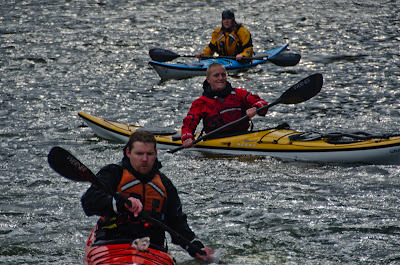 Participants head out for a long boats in currents course. A calm launch beach inside the mouth of the river. On Sunday, the winds were calmer in the morning, and courses on incident management and rescues as well as long boats in current took to the water. But when the wind returned in the afternoon, most participants chose surfing courses, and again Sandy Beach was the site for surfing and a few "yard sales. "* From time to time, a snow squall blew through adding an additional element of excitement. Paddling along the rocky shoreline. Tucking into caves and crevasses. 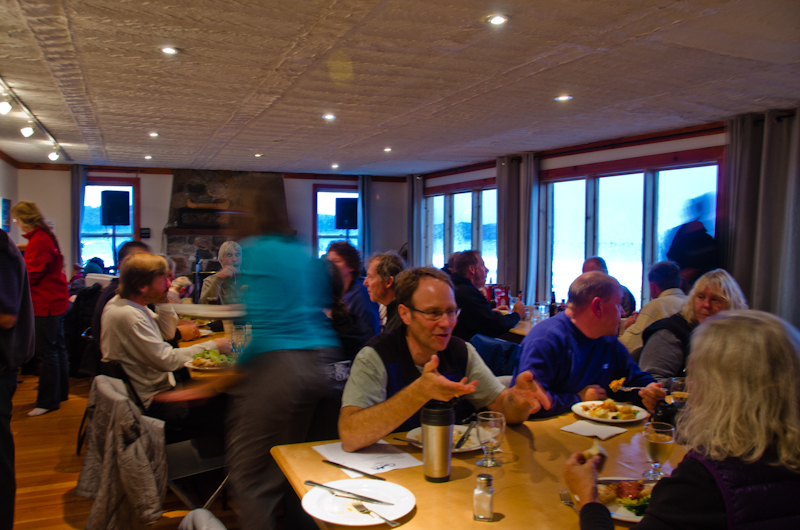 Throughout the symposium, coaches and participants shared meals in the cozy Rock Island Lodge. The kitchen staff served up tasty, hot food to cold paddlers at breakfast, lunch and dinner. 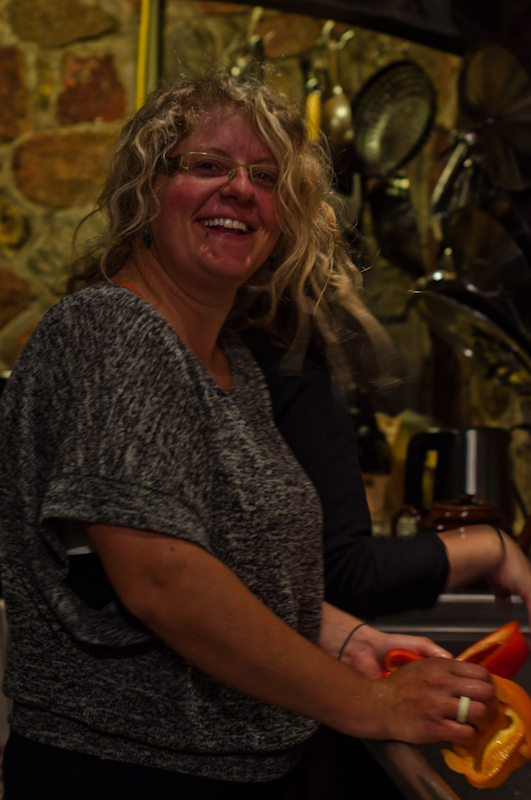 These meals also provided opportunities to socialize and share stories of the day's courses and experiences. 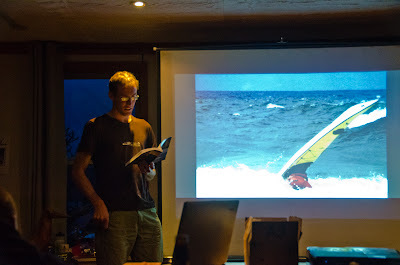 Evening meals were followed by presentations from featured coaches as well as local authors Connor Mihell and Darrell Makin, who've written books about the history and conservation of Lake Superior. Lunch time at the Rock Rover Lodge. Conor Mihell reads from his book, The Greatest Lake: Stories from Lake Superior's North Shore. Bryanna, kayak guide and member of the hard-working kitchen staff. After dinner and presentations, participants set off for their tents or local motels for a well-earned night's sleep. 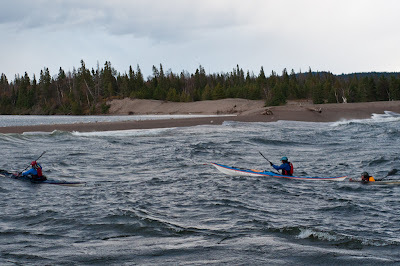 The combination of exhausting paddling and early start times (breakfast at 7, on the water at 9) didn't promote the type of late-night carousing typical of other symposia. 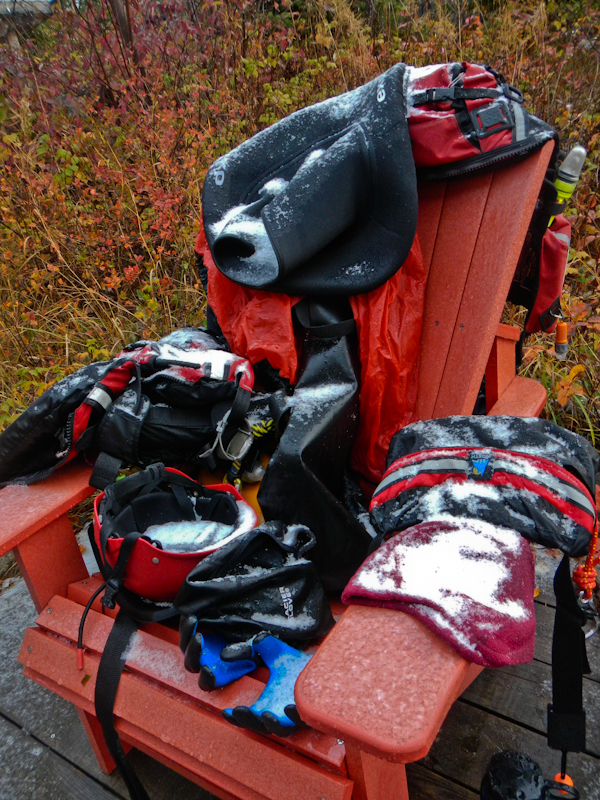 At 7 a.m., gear left outside to dry was covered in snow. For us, the Gales offered a rare opportunity to coach in conditions. The base of the pyramid in kayak instruction -- as in other sports -- is much larger than the top; most courses are for beginners, so it's a treat to coach intermediate paddlers. It also offered an opportunity to work with other committed coaches and share ideas and techniques. 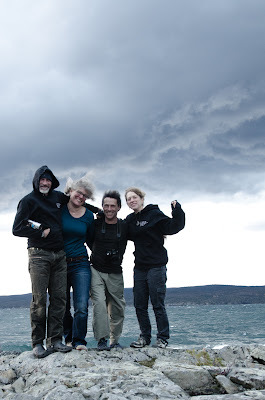 Leon, Shawna, Alec and Sharon, on the rocks and in the wind. 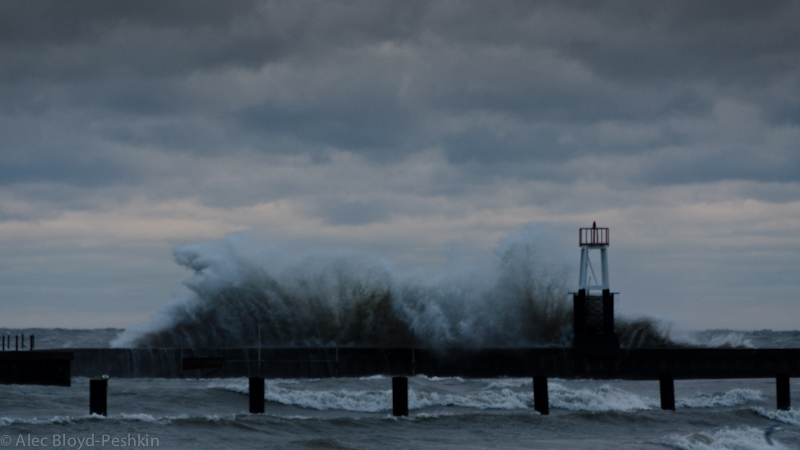 If you missed The Gales, don't despair. 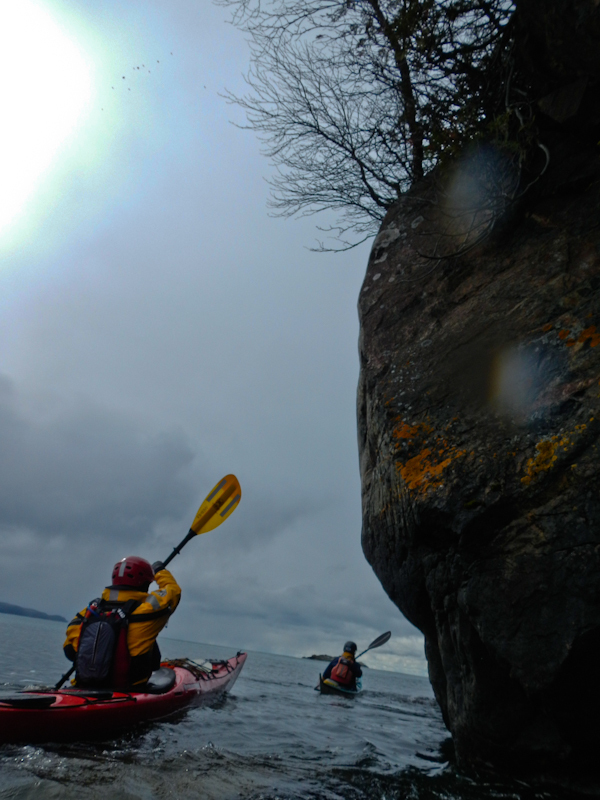 It will be held again next year in the Apostle Islands. Put in your request for time off work now. 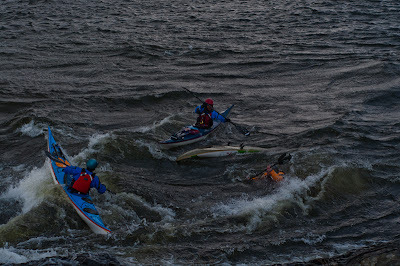 If you want to develop your rough-water skills, this is one symposium you shouldn't miss. 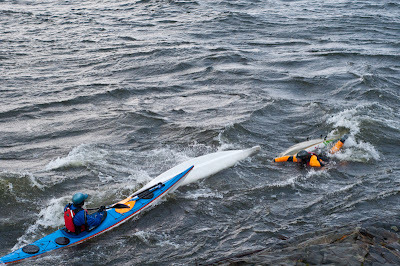 *Yard sale is a term for the random distribution of boat, paddle, person and loose gear after a capsize and wet exit in the surf.